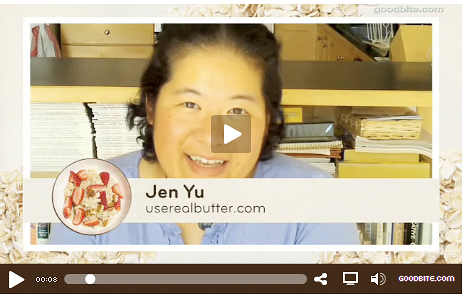 I talk about food quite a bit here on urb. (Okay, I talk quite a bit in general.) I love food. You love food. There is great joy to be found in food. Think about it. What basic functions do humans perform? We breathe. We eliminate waste products including carbon dioxide. We sleep. We eat and drink. Yet, food and beverage have been elevated to levels light-years beyond the rest of the human essentials. And the disparity between those of us who enjoy and those who go hungry… well, it’s enormous. If you have been reading urb for the past week, you know I’ve tossed my hat into the ring and joined my beautiful friend, Tami of Running with Tweezers and several other food bloggers in her Eat on $30 project which begins this Sunday. I’ll definitely be talking about that next week, so please follow along and join the discussion. Awareness is key. Last month, I posted about an opportunity I am honored to be a part of: The Awaken Your Senses Challenge sponsored by Quaker Oats and Good Bite. Short-term memory? Need a recap? Too lazy to click on the link? :) Good Bite has brought twelve food bloggers together to share their favorite food memories. Chef David Lawrence (of Good Bite, sweetiepie) recreates these food memories by snazzing up some Quaker oatmeal. Every two weeks, Good Bite rounds up four of the bloggers’ food memories in video and they go head to head in a voting competition. Each round produces one semi-finalist and in the end three bloggers will duke it out for the most votes. So why should you care about voting for the bloggers? It’s not about the bloggers, silly! It’s about the charities they are championing. The good people at Quaker are offering a $500 donation to each blogger’s chosen food charity – but the WINNER gets $10,000 donated to their food charity! That is a hefty chunk of change. More than that, it will help to feed a lot of people. Catherine of weelicious.com emerged victorious from round one. Congratulations, Catherine! Now she gets to cool her heels while the remaining eight bloggers vie for the two empty semi-finalist slots. i’m on good bite and i NEED your vote! That’s right! I’m up this week in ROUND TWO. This is huge for me because I don’t do video, but my piddly issues are irrelevant when given the opportunity to help a good cause. Plus, my fellow round two-ers are really awesome people: sweet Kath of Kath Eats Real Food, Marc of No Recipes (someone I admire), and my dear friend, Diane of White on Rice Couple. There are children in this country whose best meal of the day is their school lunch. The National Farm to School Network works to make that meal healthy and fresh by connecting school lunch programs with local farmers. Exposing young people to fresh produce and educating them on where food comes from helps to promote long-term healthy eating habits. Our nation’s family and local farms benefit too. It’s about community, education, health, sharing… it’s about our future. 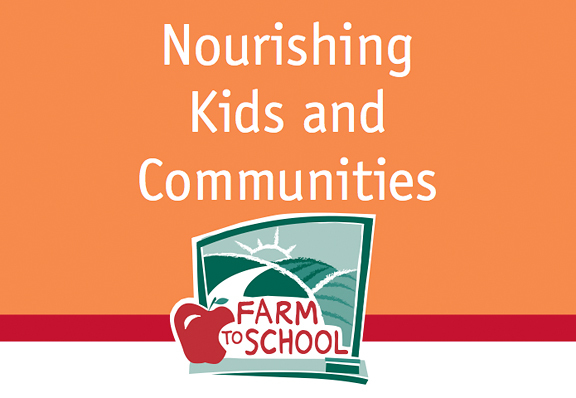 Take a look at this gorgeous brochure from Farm to School. Seeing those adorable kids gardening and digging in the dirt puts a huge smile on my face. 1) Visit Quaker Talk on YouTube (just click the link – I made it easy peasy for ya!) in the next two weeks. 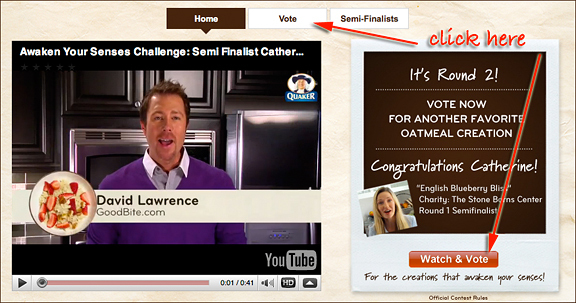 2) Click on the Vote or Watch & Vote button. 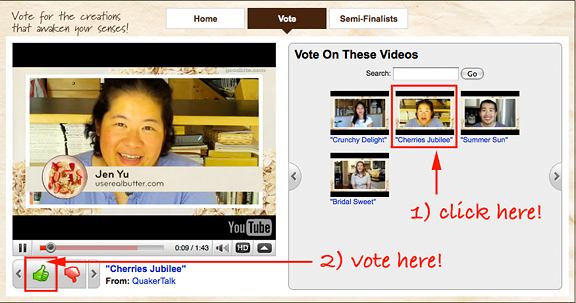 3) Select my video (it isn’t always in the same position depending on how you get there, so you’ll have to actually READ for my topping: Cherries Jubilee) and click on the GREEN THUMB to vote for my topping! Really now, we’re all friends and these are all awesome charities and terrific food bloggers. It’s not about the winning, it’s about the giving. Go vote and be a part of this effort to raise hunger awareness and to help a good cause win $10,000. You have two weeks, so please vote! From the bottom of my heart, I thank you. I liked your charity best among this week’s videos – hope you win! Cherries, chocolate & almonds? I’m in. Ok, I’m on it! Fingers crossed for your program to win. I voted for you Jen! I do love Diane very much as well; but you are my FAVORITE blogger hands down! :o) Good luck! Okay, so all I did was click on your video and then on the green thumb but I found it VERY unsatisfying! There wasn’t any cool noise or graphic or anything and I was like…did my vote for Miss Cutie Cherries Jubilee go through? They need a little cheer or something once you vote! You got my vote! Great cause. I’m involved with Recipe4success here in Houston. We’re trying to combat childhood obesity by going to elementary schools. We teach and practice organic gardening (actual veggie garden on the school property), harvesting, and cooking. I love to show the kids that food comes from the ground and not a box in the grocery store! Great cause. Brave of you to do a video – I would be a total dork. I’ll jump on over there and vote. hey, I LOVE your photos! You have a great eye! I’m just starting to get into photography, and am learning alot. I found a used nikon d80 on craigslist for a steal of a deal, and its been so fun learning to use it! oh by the way, I tried your cheese fondue recipe, and it was awesome! Thanks so much for sharing it! I will go take a look at the videos during my lunch time! I already know who I will be voting for anyway! Cheers to you and bless you for your kindness! Good luck Jen! Awesome video and amazing work. Love your website and hope you win~! My favorite cause is Long Island Cares.